Jon (aka “JOB”) hails from Parbold, England and currently resides in Liverpool, England where he works full time for Camp Leaders (an international summer camp agency that provides staff for camps all over America). They are kind enough to give Jon the summer months off to return to Echo Lake before starting back at the end of August. This coming summer will be Jon’s eighth year at Camp Echo Lake, and his fifth as Senior Village Boys Head Counselor, a role that he set his sights on during his first summer at the camp. 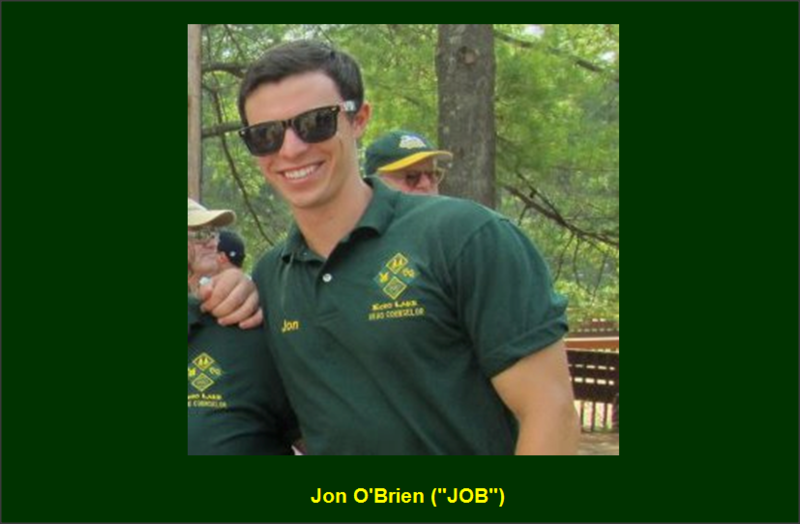 Prior to becoming the Senior Village Boys Head Counselor, Jon spent his first two summers at Echo Lake as a Fitness Head Specialist/Upper Village Boys Counselor. In his third summer, Jon was thrilled to be a part of the 4n4 staff. (Read his 4n4 story here). One of the things that Jon loves about Senior Village is that it is one, unified village made up of the oldest boys and girls in the camp. And though his title is Senior Village Boys Head Counselor, he considers himself to be just one cog in the well-oiled machine (along with Kersti Kienitz and Stefano Antoniazzi) that operates under Brenda Levine’s incredible leadership. The team prides itself on working together to provide guidance and assistance to all campers and staff in the Senior Village. During his time at Echo Lake, Jon has proudly watched the amazing growth of his campers who have evolved into their roles as fellow staff members. This summer will be my 8th at Echo Lake. My first two summers were spent as the Fitness Head Specialist. My third summer was spent on 4n4, and since then, I have been the Senior Village Boys Head Counselor. I was a couple of months away from graduating University in England, and I wanted to travel across America post-graduation during the summer before starting full-time employment. After growing up watching Bug Juice, I always wanted to go to camp. Since that wasn’t an option, I decided that the next best thing would be to work at camp. I subsequently joined Camp Leaders (a summer camp agency), and was offered a position at Echo Lake. Going into my first summer, I had planned to do one summer, and that would be it. That one summer changed my life, and one summer has turned into seven. Trying to do justice to what makes Camp Echo Lake so special is particularly difficult. Until you’ve experienced the magic, the memories, the friendships and the special moments that camp creates, a simple description doesn’t even come close to painting a true picture. All I can say is that for seven-and-a-half weeks, something indescribable takes place that changes everyone involved for the better. Having graduated with my MBA in May from Tiffin University in Ohio, I have now returned to the UK and work full-time for Camp Leaders (who provide international staff for Echo Lake). I love soccer! I attended Tiffin University on a full soccer scholarship. I like to keep fit by working out and running every day. I have a passion for traveling and reading. I have also recently started playing the Ukulele. What are your favorite Camp Echo Lake activities? Soccer, Trek, all camp events and most of all – Senior Village special days! Every group in main camp gets to design its own unique special day, but the great thing about Senior Village special days is that they include the entire village. In the past few years we have always had a Lazy, Crazy, Bon-d fire special day. This involves a morning full of sugary cereal (a huge treat at camp), Pop Tarts and watching cartoons, followed by a day of crazy activities and getting extremely messy. In the evening, we have an open mic at the Senior Village campfire and finish with a special treat of banana boats and s’mores. The other Senior Village special day varies from year-to-year. Last year, for example, we had an incredible Hunger Games-themed special day. It was a huge success! These special days are just a great way of completely mixing up the schedule for a day to allow the kids go a little crazy. We have some amazing special days planned for this summer!! Part of the beauty of camp is that sometimes the best moments are the ones that happen without any preparation or planning. In my first summer at Echo Lake, during a rest hour, our entire cabin sat out on the porch and started singing along to one of the guys playing guitar. After a while, more cabins came out onto their porches and started to join in. Suddenly, the girls started to do the same, and a huge, spontaneous Senior Village sing-along took place. There will always be a special place in my heart for the 4n4 trip. I think that the 4n4 summer is a truly unique experience that changes the campers in so many ways. It’s the first time that the boys and girls combine to form one group. This makes the dynamics far more interesting, as it allows the guys and the girls to become really good friends. The changes that take place during the 28 days away from camp really are incredible. Being away from camp creates a special bond that can only take place in that kind of situation. The campers mature so much in a such short amount of time. I feel closer and more connected to my 4n4 group than any other group that I have worked with at camp. It really is an amazing shared experience. And finally, the one moment I look forward to the most at the start of each summer is when Tony does his pump-up speech the day before the campers arrive. I think that, in that moment, it really hits home what is about to happen. Tony delivers his speech with such passion and emotion that everything clicks, and the staff suddenly realizes that they are about to be a part of something truly special!